With the expansion of the Walker, there are now 40,000 square feet of galleries to walk through. Which can mean a lot of tired feet. Happily, the new Herzog & DeMeuron wing has several public areas which provide room for seating. (I’ve seen quite a few visitors almost asleep on those big, bed-like benches in the sunny Cargill Lounge.) The same is not true for the original Barnes wing, I’m afraid. From the Bazinet lobby to Gallery 8 restaurant, it can be a long walk with nowhere to rest.As they plan exhibitions, the curators do look for opportunities to provide places for sitting and reflecting. 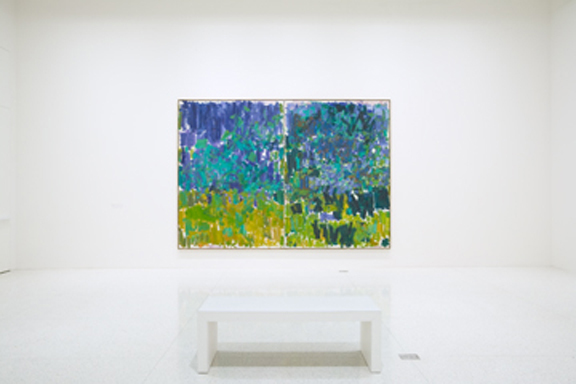 They know how great it can be to sit in front of a piece like Kazuo Shiraga’s Untitled and stare into the thick swirls of paint, imagining the artist’s toes sliding across the canvas. However, they also plan the gallery layouts very carefully, making sure the objects on display relate to one another in form, color, or content. The art must be primary; too much furniture and the gallery begins to look like a living room. There’s also the fact that the benches we use are sleek and minimal, which in some cases can cause some confusion: “I’m sorry sir, that’s the bench over there. You’re sitting on a Donald Judd sculpture.” When the choice is between showing more art and including more seating, art wins out almost every time. So I’m pleased to say that for her upcoming exhibition Sharon Lockhart: Pine Flat, the artist requested that we include some seating. Specifically, Lockhart requested a sack-back Windsor settee in black. As much as I know about furniture styles, she could have requested an eep ork glooble blop… in black. Luckily, she sent us a picture and the name of a man who makes them. She chose this style because it is handcrafted and provides a touch of “Americana” for this exhibition that looks at a specific slice of America. We contacted the woodworker and, after his laughter subsided, he told us that he had 18 months worth of orders and there was no way he could make a settee in time for our April 22nd preview party. So the search was on. You’d be surprised how many craftsmen are out there who specialize in Windsor chairs. (And I do mean craftsmen. There is an appalling lack of female woodworkers out there. Come on, ladies, pick up the lathe!) We started with those closest to home, and found that none could turn out a new settee in three weeks. One gentleman in Baraboo, Wisconsin had a rejected special order sitting in his studio, but it didn’t have a sack-back, so that didn’t work. Lockhart sent us a few more links to manufacturers who made the right style, and, as seems typical with the internet, I ended up slogging through a lot of sites only to find a source right in our own backyard (assuming our backyard stretches all the way down to Rochester). One of the manufacturers had a listing of their retailers, and one was in Plainview, Minnesota. I figured it was a long shot, but I called The Country Life and – lo and behold – they had three settees in stock! Two were in a cherry stain, but the third was black. A quick check of that manufacturer’s website, an email to the artist with a jpeg of the bench, and we were ready to buy a settee. The final ironic twist? The store owner’s name is Agnes Martin. She was tickled when I told her we have an Agnes Martin painting hanging in the galleries at this very moment.So come see Sharon Lockhart: Pine Flat and take the opportunity to sit a spell. Please! We worked hard to find it; it’ll be a shame if it doesn’t get used. Oh, and since the Walker’s unlikely to need something like this in the future… anybody want to buy a used sack-back Windsor settee?